Lake Champlain is a truly fascinating place. It’s an ancient lake with many of secrets, some of which still have yet to be discovered. Those who know me know that I’m extremely interested in Lake Champlain and the endearing Lake Champlain “monster” mystery, whether through my On the Trail of…Champ documentary series or beyond. For most people, the idea of an undiscovered monster lurking in a lake that has been frequented by humans for thousands of years is strange enough. However, there exist stories that get even weirder. Something I’ve wanted to do for a while is talk about the stranger stories I’ve heard during my travels and investigations around Lake Champlain. These are a few. While in Port Henry, New York (self-proclaimed “Home of Champ”) for the annual “Champ Day” event in July of 2017, I met an interesting fellow named Frank who had seen what he believed was Champ on a beach near Bulwagga bay (many sightings have taken place in Bulwagga Bay) in the 1980’s. His description was that of the more “classic” plesiosaur type creature with blackish skin, a long neck and flippers, as well as white scrapes and scratches on its sides. His full encounter is in episode two of On the Trail of…Champ and while it is certainly a fascinating story, it wasn’t the only story he relayed to me. A lifelong resident of Port Henry, Frank told of being in a boat with a friend some years ago in a marshy area of Bulwagga bay. They noticed a large snapping turtle shell in the mud and were attempting to retrieve it when they came across what they initially believed to be a large drainpipe. Confused by what the object was doing in this location, Frank was skeptical that it was a pipe and his friend then proceeded to throw a piece of wood at the object. It then became animated. “That thing came right up man and hissed…mouth opened up and nothing but teeth you could see it…it swirled around and went right into the water,” according to Frank. They were both understandably terrified and ducked down in the boat, hiding for a few minutes. Frank was sure that this was quite different from the “Champ” creature he had seen, with a long serpent like body at around 30 feet long and two feet thick. Since then Frank has refused to swim in the lake. This account got me really thinking. Most of the older Champ sightings (pre-20th century) describe a serpent like creature, the press even dubbing it the “Lake Champlain Sea Serpent” in the 19th century. The Abenaki and Iroquois folklore describe a water serpent of sorts. Story goes that at the scenic Split Rock Mountain, which abuts the lake, there is even a large fossilized snake skeleton, although that has been disputed. The mountain is notorious for a population of Timber Rattlesnakes. In fact many areas and features around Lake Champlain are named after serpents and snakes, such as Rattlesnake Mountain and Snake Den Harbor in New York and Snake Mountain in Vermont. 11 known species of snake inhabit the areas around Lake Champlain. I’ll never forget that while filming On the Trail of…Champ and kayaking near the mouth of the Winooski river, some folks from shore began shouting “snake! snake!” in my direction and I saw a Common Watersnake swimming close by. No Champ, but still witnessed a water serpent! In terms of Champ sightings, there are relatively few reports that describe seeing flippers, or even a large body, and those reports that do see more than a hump in the water describe a snake like head protruding from the water, accompanied by humps or a back in some cases. So what exactly are we dealing with here? Frank told me that the only other people he was aware of who saw a similar creature to the one he saw was a couple of ice fisherman fishing on Bulwagga Bay during wintertime. They saw a large snake like creature emerge from the ice and wrap itself around a large piece of ice, but the creature quickly retreated into the water. Champ sightings are virtually unheard of during the winter months aside from a 1971 report, coincidentally also near Port Henry, where townspeople saw a creature break its head through the ice near Velez Marina (today called the Port Henry Marina). Frank’s story immediately stood out to me upon reading a letter of an encounter submitted to prolific Champ researcher Joseph Zarzynski by Thomas E. Morse, who in 1961 was driving by North West Bay in Westport, New York. “When first seen it appeared as a massive gunmetal gray approximately 18 inch wide cable on the shore and into the lake. It appeared to be a monstrous eel with white teeth that raked rearward in the mouth,” wrote Morse. An American Eel caught in Lake Champlain. Like with many lake monster stories, large eels have been pointed to as explanations for what people are seeing. While a large eel could certainly explain a portion of Champ sightings, it does not explain all of them. Dr. Philip Reines, a former professor of communications at SUNY Plattsburg as well as Loch Ness Monster and Champ investigator, had a rather interesting encounter with a large eel while scuba diving in Valcour Bay in 1975. He described it looking like a big white plastic pipe and around ten feet long. Dr. Reines would later be one of the first to investigate the 1977 Sandra Mansi photo alongside Zarzynski in the 1980’s. Noted Vermont folklorist and author Joseph A. Citro writes in his 1994 book Green Mountain Ghosts, Ghouls & Unsolved Mysteries, “As I study these accounts, one thing seems obvious: the monster seen on land is very different from the monster seen in the water…Are there two different varieties of “monster” in Lake Champlain? Perhaps the next generation of monster hunters will found out for sure.” Two decades later and unfortunately not much headway has been made regarding this matter. Echoing Citro, perhaps the future will be more promising. 2. UFO’s in Lake Champlain? Whenever I’m around Lake Champlain and visiting some sort of location, I usually try and strike up a conversation regarding Champ, as I love hearing what locals think and if they’ve had any experiences or know anybody who has. This can be quite interesting, as was the case with a gas station near Saint Albans, Vermont (the waters around Saint Albans are believed to be where Sandra Mansi took her famous 1977 photograph) where I stuck up a conversation with the cashier about Champ. While she was familiar with the story of Champ, she had no experience to relay, but she did mention that “all sorts of strange stuff happens in that lake”. She then proceeded to talk about a large UFO that people would see flying in and out of the waters of the lake. Aside from that she gave no other details, as it was a local lore type of story. There is a long history of UFO sightings around Lake Champlain however, including an exploding object over Burlington that was seen by a former governor and a Catholic bishop in 1907. In August of 1968 on the shores of Buff Ledge Summer Camp in Colchester, two camp counselors witnessed a strange craft flying in and out of the lake and would later claim to have been abducted by the UFO. In 2016, a man on his boat witnessed a UFO hovering over Shelburne Bay as it dropped 3 or 4 unknown objects out of sight of the witness, according to a MUFON report. Many other reports exist and it is interesting to see the interaction of these supposed UFO’s and the lake itself. An eyewitness sketch of the craft & beings seen at Buff Ledge in 1968. Around a year after hearing about the UFO story, at that same gas station in Saint Albans, I once again inquired with the cashiers about any Champ stories. While they had no Champ stories to speak of, they first told me of a haunted movie theatre in town, followed by the story of a ghostly pirate ship that was said to haunt Saint Albans bay at night. This piqued my interest quite a bit. Ghost pirates on lake Champlain? The history fanatic in me couldn’t resist researching the back story. “Pirates” were present on lake Champlain in the past and while they weren’t the swashbuckling eye patch-wearing pirates found in the tropics in popular culture, there were certainly tales of tough crews of pirates, marauders and smugglers operating on the lake during an interesting time in history. Lake Champlain hosted various naval battles during the revolutionary war and following that time period in the early days of the United States, the lake was contested by Great Britain, the United States, as well as France to some extent. In 1807 President Thomas Jefferson issued an embargo intended to prevent trade with British Canada, which backfired significantly as large-scale smuggling operations began in Vermont as a result. 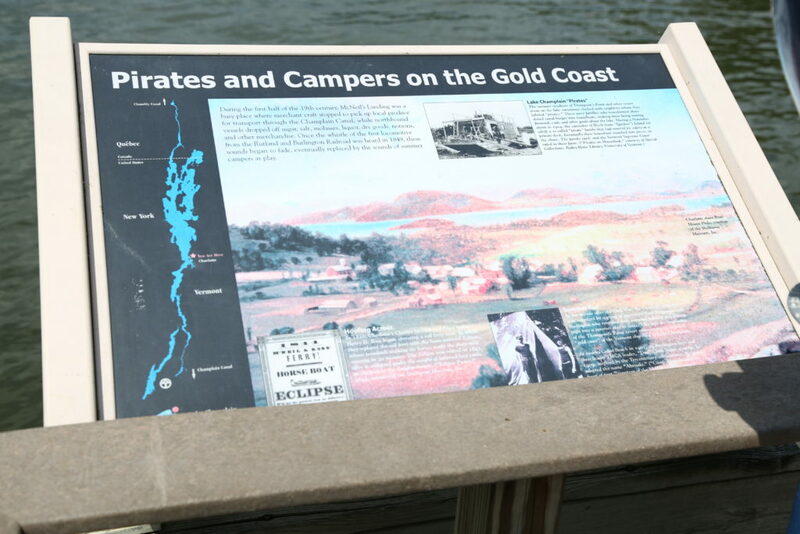 Sign describing pirates on Lake Champlain's Gold Coast in Charlotte, Vermont. Smugglers began moving valuable goods such as potash, timber, grain and other commodities north to Canada through Lake Champlain. They utilized Vermont’s mountains to move goods through rugged areas, such as the famous Smugglers Notch, before they would load up ships that would sail north on the lake for Canada, many of the goods ending up in the hands of merchants in Montreal. The most infamous pirate ship was called “The Black Snake,” interestingly enough. It was painted completely black and had a tough crew armed to the teeth with muskets, clubs and an 8-foot-long wall gun. In 1808 on the Winooski River, the crew of The Black Snake ended up in a shootout with federal agents and Vermont militiamen sent to quash their smuggling. The pirates killed three men and wounded another before being rounded up and captured. They were put on trial in Burlington and some of them hung in Vermont’s first public execution, while others were imprisoned. Piracy and smuggling around Lake Champlain continued to a much lesser extent after the termination of the embargo in 1809. In 1819 a ship known as The Phoenix was set on fire, likely deliberately, for somebody to make a quick swipe at the contents of the ship. The shipwreck of The Phoenix is a popular scuba diving location to this day near Plattsburg, New York. 1819 was the same year one of the first recorded Champ “encounters” was published by a newspaper in the form of a semi-satirical article about a 187-foot-long monster in Bulwagga Bay. With the age of piracy long gone on Lake Champlain, the legend of The Black Snake lives on, perhaps in the form of ghostly ship seen during a foggy night near Saint Albans, so the story goes. 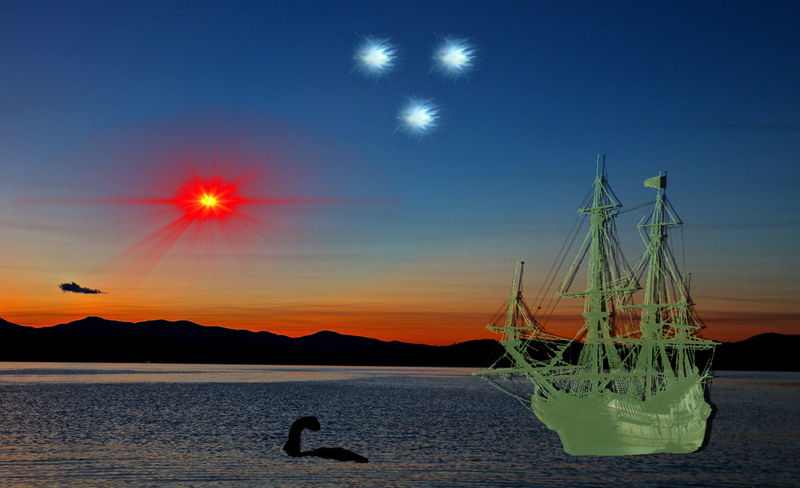 Stories of various lake monsters, UFO’s and ghost pirates sure make Lake Champlain sound like a fantastical, albeit terrifying place. In reality, it is an incredible area with a rich and fascinating history and I encourage all interested in visiting to learn more about this special place. 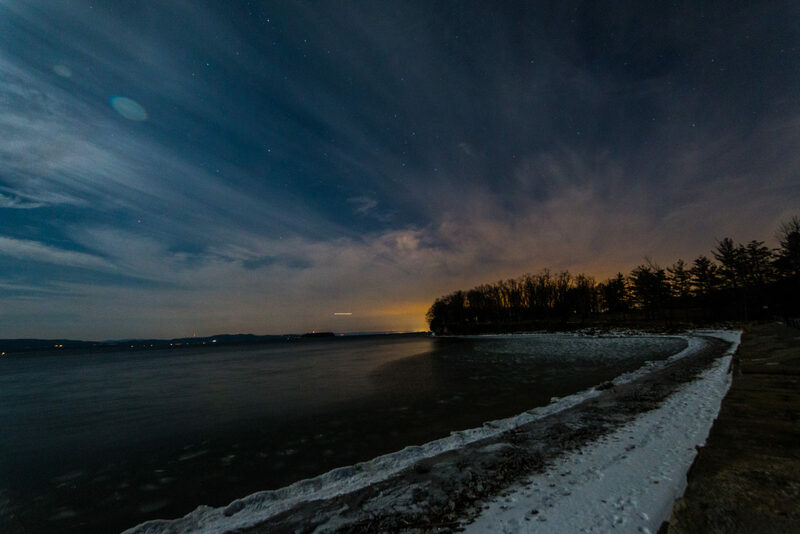 Night sky over Lake Champlain during winter. Great stuff Alek. There’s a lot more to Lake Champlain’s weirdness than Champy. The Great Lakes are famous for UFO’s and crazy cryptids and paranormal stuff too. Definitely! It’s an endlessly fascinating body of water.